Manitou has always taken great pride in partnering with our parents and the entire Manitou community. We hold many Manitou Cares events at camp and in the city, bringing in guest speakers to discuss pressing issues surrounding our youth. A few years ago, a renowned physician from the US joined us to talk about the concerns and risks of social media and how to place appropriate controls on your children at a young age. 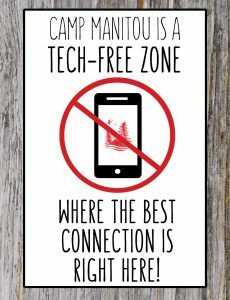 “TECH FREE ZONE- the best connection is right here.” This reminder, posted all over camp and on every cabin, was the theme of Summer 2018 at Manitou. Most of our campers will admit that they love being able to check out of the instant communication world and talk in real time. It lowers their stress levels and allows them to be engaged in the world around them. That’s one of the many things that makes camp so great! Though social media has, undoubtedly, become a large part of our world, cyberbullying is a very real problem. Instagram in particular, one of the most popular platforms, has a significant flaw: users can set up accounts at any age without verification of identity. Imagine how easy it is to set up a fraudulent account using someone else’s name and photo and send out messages under this assumed identity? It is important to know that Instagram has no legal obligation to investigate fraudulent accounts to see who created them, leaving users without any recourse. This form of identity theft or slander can also occur by hacking into another user’s account. In fact, we know of a few cases where someone else assumed a Manitou camper’s identity without permission. We urge you to continue educating your kids about digital awareness. Make sure they know to be aware of concerning content on their Instagram feed, understand that it may not be from the person they think it is, and know that its always important to question anything they see that doesn’t seem right. Please encourage them to come to you if they receive alarming or negative messaging, even if they are embarrassed to talk about it. It is easy to forget that online actions have real world repercussions, especially for a child. When kids have multiple Instagram accounts, not only are they likely spending too much time on social media, they may also be representing different versions of themselves to a wide audience, unaware of the potential negative impact this could have. Kindly take a few minutes to read the article below. It’s a rapidly changing world and while you may be aware of what your kids are doing on social media, it can be tough to keep up. We encourage you to keep the dialogue open about the risks surrounding social media and don’t be reluctant to let your child know that placing limits on their technology use is healthy. After all, that time away from social media is one of the reasons why camp is so great, let’s remind them of this and work together to make social media a positive space for everyone. With 2 weeks to go 280+ tickets have already sold – reserve your seats NOW! The Manitou theatre is coming to Toronto in just 2 weeks! This past summer, a talented group of campers put on one of the best performances Manitou has ever seen. 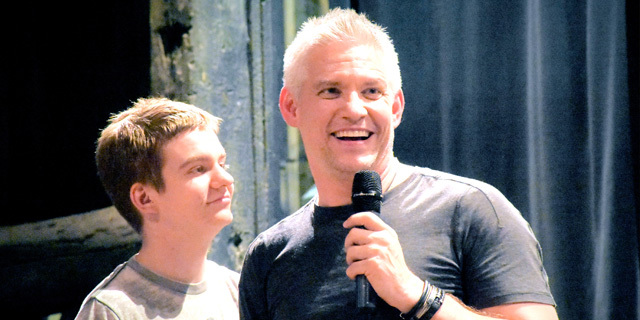 It was the broadway musical ‘Les Miserables’ and we can’t wait to share it with everyone. Join us for what will be a spectacular evening of Manitou entertainment! If that isn’t enough, everyone’s invited to join us at our post performance get-together where rumour has it there will be delicious camp treats, games and hidden clues to next summer’s Tribal Games theme and World Games countries!We are excited to announce that the Manitoucamp Foundation is supporting Children’s Aid Foundation of Canada for our 2019 season. Through the foundation, the proceeds from Les Miserables will be donated to help CAFC improve the lives of children and youth in the welfare system. 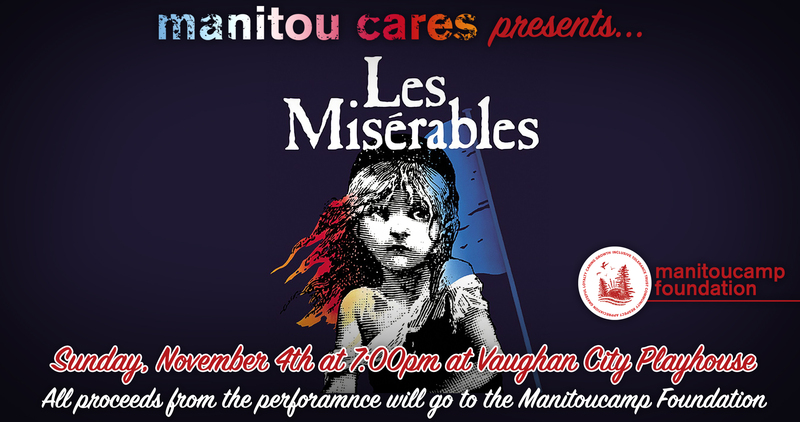 In honour of this announcement, CAFC will be joining us to give a short presentation before the play and we will have a donation bin for packaged diapers in the lobby – please bring what you can and support families in need! Tickets are available now and are $40.00 for adults or $25.00 for students. You can order online anytime by clicking HERE. Tickets are also available at the box office by calling 905-303-2000 and press 4 to purchase. We can’t wait to reunite as a camp community and relive the magic from the past summer. We hope to see you there! Never have we seen so many tears. It was for sure the summer of all summers. 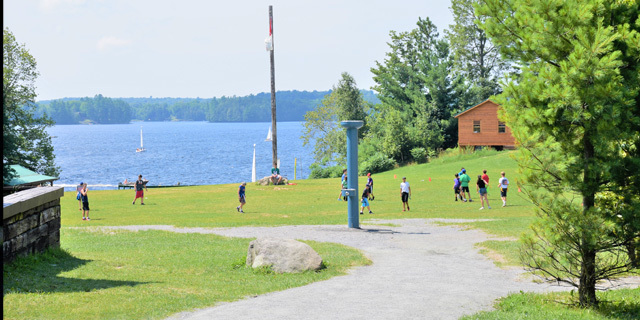 Read on to hear what some of our campers and staff had to say as we enjoyed our final banquet, camper awards, five year backpack ceremony along with a wonderful “slide show”, and the camp singing three days in counting after honouring three life long staff for their 15th summers. The flag came down as we heard from our eight campers speak about their summer, and honoured our Jordanna Lokash winners. Our 15 year honorees had such touching thoughts after hearing warm felt words about them. Freshkids: “ This year I was old enough that my mom said I could stay six but I convinced her to let me stay two months, camp means to me being in a fun place with others and family, to grow camp spirit. Thank you to my counsellors and my friends for the best summer ever”. Sophomores: “ Camp is like my second home…scratch that- it is my home…if I didn’t come to Manitou years ago I wouldn’t have made these awesome friends, great memories …I have learned so much over the years from waterskiing to cooking”. Camp is beautiful. The forests that surround us are breathtaking. The view of the hot yellow sun as it sets over the panoramic blue lake is a sight we only get to see here. And if you look up its nights like tonight where the stars are glimmering in the dark sky, that truly shows the beauty of Manitou…Here at Manitou we are taught to give back to our local community and the rest of the world. Manitou Cares. Manitou Cares because it wants to. Manitou cares because it builds character and helps us become good global citizens. Camp is all the staff putting in hundreds of hours keeping us safe, planning events and making sure we have an amazing summer. They put in so much energy each day to see a smile on all our faces. Camp is lessons learned, lasting memories and lifelong friends. 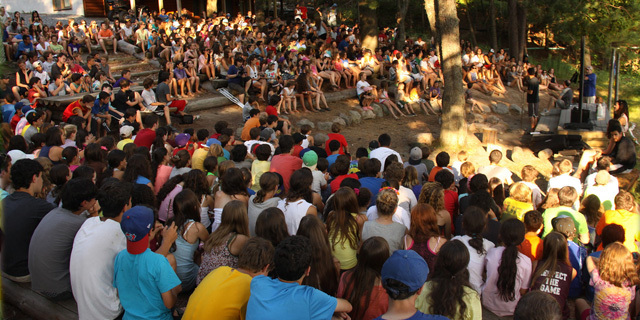 CIT: Camp to me is being able to represent the place you call home. It is laughing with friends as you airball your next shot. Tt is waking up every morning knowing that in the end the play you perform will be amazing. It’s the chills when you sing “deep in the heart of the north” every Friday. Its choreographing something hilarious with your cabin mates. Camp is our emotional home. Thank you to everyone who has made the past five summer of my life the best ones yet. Last night before our poignant Walk of Hope, we shared with our campers and staff the many values that we hold so important here at Manitou. We ask that you set aside 15 minutes of your day to watch the video below as a way of connecting with our message and experiencing the same magic that your kids did yesterday evening. As we embarked on our annual tradition of the Walk of Hope, each of our units discussed the many charitable endeavors that Manitou is supporting this summer but more importantly, discussions were held around the theme of the video below. All campers were asked to contribute their ideas on what might be pursued when they get back home to positively impact their world. The senior unit spent several hours discussing incredibly well thought out concepts for new charitable initiatives that were then presented to us all for consideration. We are proud to say that the ManitouCamp Foundation is providing a $500 donation for what we feel is the most inspiring cabin idea to support! We had a wonderful, inspiring evening last night as we welcomed the Lake family, representing the charity AUTISM SPEAKS, our charity for second month. Fireside started with our usual candle ceremony honouring campers in each unit for representing the Manitou values. We also had a wonderful Sophomore do our “Camp Is” speech as she was on a canoe trip the week before. We are including her speech below as an example of the wonderful words of wisdom that come from our campers. We then kicked off Community Week by talking about the many events that will be held all week long to raise money for Autism Speaks. The activities, cabins and individuals will be coming up with ideas to help raise money for this charity and then our foundation will write the cheque to Autism Speaks. Even a Freshkid cabin, independent of their counsellors, approached us with an idea that was simply brilliant and well thought out. Look out for more information about our Community Week events soon! On Monday night community week reaches its pinnacle with our Walk of Hope, where campers will learn more about the POWER OF ONE and how one person can make a difference in the lives of others. 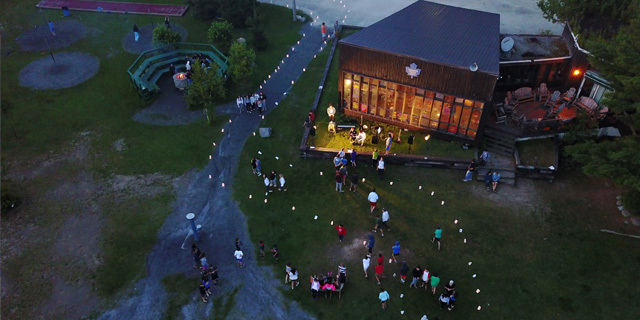 Campers will partake in a discussion with their unit about the Power of One before walking around a candle-lit field to the sound of campers’ musical performances. We also welcomed MP Mike Lake, his daughter, Jenae, and his son, Jaiden to camp. Mike came to speak about Jaiden, a wonderful young man with Autism. Together, the three of them gave an impactful speech on what it is like to have Autism and how Jaiden, despite being unable to communicate with words, is able to communicate messages of love, life and the power of one so effortlessly. 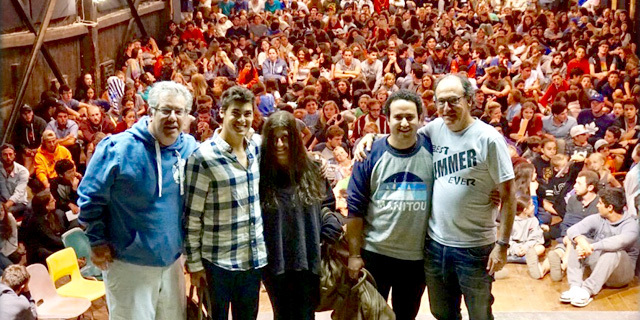 You could hear a pin drop in the theatre, as the campers were so inspired and touched by the Lake family’s talk. Mike along with Jaiden and Janae then spoke to the CITs and seniors separately for a more detailed talk about autism and developmental changes. Jaiden, his father, and sister are spending the weekend with us and its truly an honour to see such a loving family teach us all what truly matters in our lives. At lunch on Friday, Jaiden ran up to the Microphone when he heard his name and gave high fives to over 100 campers and staff. The spontaneity of his actions set the tone for the weekend. After this wonderful evening, campers made the special paper bags with beautiful designs that will light up the field and then went back to the cabin for a special bead ceremony. Ask your kids about the questions they were asked to further educate and remind your children of the wonderful lives and privileges they have and to emphasize the values that we all hold dear to us. If you feel inclined to support Autism Speaks, please click on the links below. This is my second summer at Manitou. When I first arrived last summer, I had the normal jitters than any camper would have. Of course, I really missed my cat…By the way, his name is furball. But right away I started to make new friends. Here is a poem that I wrote about why Manitou is great. U is for YOU, with all of your grace, because it is you that makes Manitou OUR special place! As you know, at Manitou kids can really develop their skills because they pick their own activities and change them weekly! But we also love to have fun, special days at activities throughout the summer. After all, camp is about new and exciting events that require creativity and imagination. Just today for example, Fitness held a triathlon that kids could sign up for, involving running, swimming, and canoeing. On top of that, OCS hosted a flag football tournament, and at Soccer we had the Champion’s League Tournament. Hockey also had a special event – our annual Dany Markov Roller Hockey Tournament. Basketball joined in yesterday with a special 3-on-3 tournament and Volleyball did an incredible fun filled event as well. It was hilarious watching the “Masters of Mini Golf Tournament” today, as over 50 campers participated in a test of patience and endurance while we listened to play-by-play commentary. Golf even presented the winner, Ben Svonkin, with the traditional green jacket. Still, our most unique activity today was ‘Swimitch’ – a combination of quidditch and swim where for two days, kids enjoyed their favourite Harry Potter sport while cooling off in the water. Watching 30 kids in the water, laughing and enjoying the lake and beautiful weather with their staff was a site to behold. Of course, the morning started off with our now weekly “Polar Bear Dip” where over 40 campers jumped in the lake, washed up, and had hot chocolate to start their day before breakfast. We ended the day with over 20 budding astronomers star gazing and learning about the galaxy through the lens of a new high powered telescope! Wow, that was an action-packed Wednesday! Can’t wait to prepare for our annual Community Week that kicks off tomorrow! Oh, and before I forget, make sure you check out the newest edition of Manitou’s Newspaper, The Mosquito! 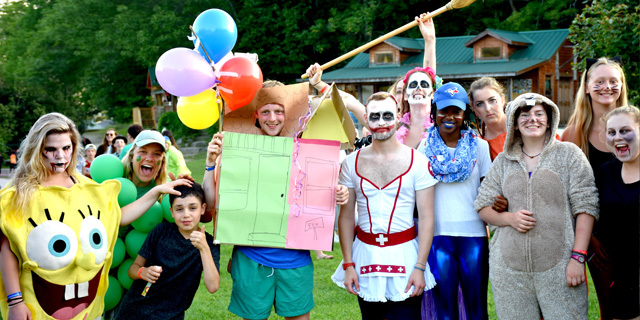 Let’s make a deal, intercamp tryouts, Halloween, canoe trips, an inline hockey tourney, a triathlon, quidditch by the lake, MHL hockey action, camp wide dance….That’s how we ended the month of July yesterday. All that and so much more!! It was an epic day topped off with Chef William’s annual Steak-Frites dinner complete with homemade pumpkin pie for dessert! The trick or treaters were in full swing and enjoyed hay rides, the always crazy Haunted House and our newest tradition, ‘Trunk or Treat’, where campers got to choose their prizes from the trunks of staff cars! So much fun was had by all as we finished with our camp wide dance set against the backdrop of a magnificent Manitou sky. The temperature as just right and the campers’ spirits even warmer. Hard to believe it’s already August, but we have so much more to get excited about in the coming weeks. The lake is a perfect temperature and so many kids are excited about tomorrow morning’s ‘polar bear’ swim at 6:30am. What a great way to start the day! Second Session is in Full Swing! We are sailing into second session–We can’t believe almost 250 new second session camper arrived (an all-time record)! But the nicest part is how well they are adapting to camp. This is in large part is due to the camp culture where long-time campers welcome the new kids and where the first month campers understand how important their role is in making the second session campers feel supported. “From a young age we are taught the importance of helping others. Something we have learned from Manitou is the value of giving back to the community and the value of charity …Manitou represents this idea and is why our camp is unique. And speaking of giving back, tonight at this same Friday night Fireside we had two amazing guest speakers; Max Daviau and David Levine two former campers (and staff), who took it upon themselves at age 23 to start their own charity – “Lay up Youth Basketball”. Max who first started the charity four years ago, along with David explained to the campers that they started this charity from nothing, but what originally seemed like just a job became so fulfilling and fun because basketball was their passion and they loved seeing the impact the charity had on those in need. Kids were inspired as they learned how to start a charity from scratch, and also received the most important message that giving back is actually selfish because it just makes you feel so happy! Posted in Manitou CaresLeave a Comment on Second Session is in Full Swing! 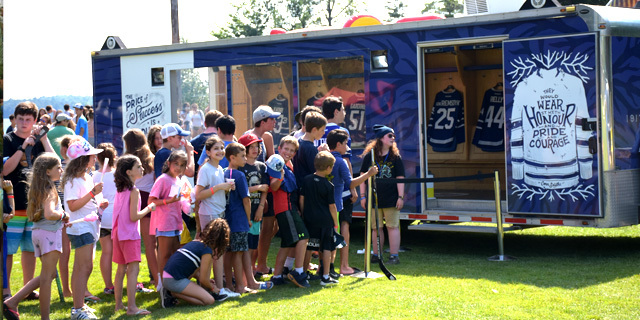 Today Manitou hosted a very special Carnival in support of the MLSE Foundation. Watch the video below to learn more about our exciting event! Greetings from the Manitou Kitchen! Feeding over 400 hungry campers and our staff is no small task! Not only do we strive to make food that kids get excited about, we are equally focused on providing healthy choices and engaging in responsible food practices. It is our duty as camp directors to acknowledge that agriculture and food production has a huge impact on our environment and at Manitou, we’re proud to lead the charge in changing the way we operate to minimize our carbon footprint. 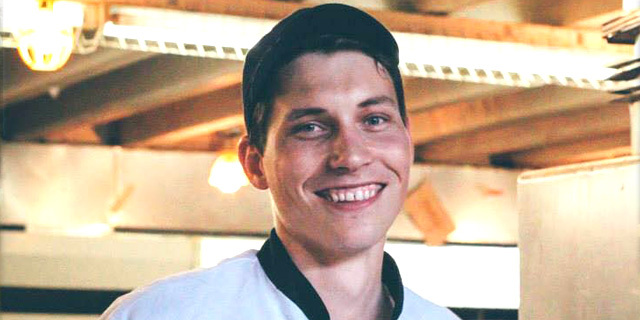 “Here in the Manitou kitchen, we’re lucky to be able to serve tasty and nutritious food to hundreds of campers and staff every-day. Meals are designed to be comforting and nutritious but we’ve got a lot of palates to satisfy! More vegetarian, vegan and gluten-free options have been added to our menu and we’re constantly aiming to be innovate in our offerings, including our world famous lunch time salad bar with over 40 different options that change daily! A huge shout out goes to Vanessa, who is simply the best special meals chef anywhere, and the over 20 hardworking staff that run the Manitou Kitchen all summer long. PS—don’t worry, our legendary Tuck Shop is also open for those special camp treats every other day!! Posted in Manitou CaresLeave a Comment on Greetings from the Manitou Kitchen!